Milledgeville Main Street and the downtown businesses have teamed up to offer a chance for February First Friday goers to win $100 in Milly Money, a downtown gift basket and Valentine’s Day flowers from Blossoms Florist. The First Friday committee came up with the idea to spread Valentine’s love through shopping local. 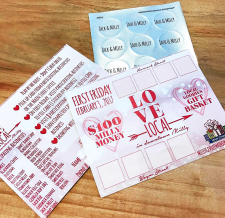 Anyone interested in entering the Love Local First Friday giveaway can do so by picking up a Love Local punch card at any of the participating businesses or at the Main Street office. The rules are simple: On First Friday, February 3rd, visit eight of the participating businesses to fill up the Love Local card- one sticker per business. Once full, turn completed card into any participating businesses. On Wednesday, February 8th three lucky winners will be chosen live on Facebook at 2:00pm. For a list of businesses and instructions visit the Milledgeville Main Street Facebook page or MilledgevilleMainStreet.com. For more information about First Fridays or how to get involved call Milledgeville Main Street or email Deana at dthornton@milledgevillega.us.